Petroleum (literally, "rock oil") is a substance that has formed beneath the surface of the Earth over eons. The remains of ancient plants and animals have been buried and compressed beneath thousands of feet of sand, mud, and rock. The organic materials, under certain geological conditions, have been transformed by overburden pressure and subsurface heat into hydrocarbon compounds, such as crude oil and natural gas . Petroleum substances have been discovered and used as fuels for many centuries, originally at the sites of natural seeps and leaks from fissures in the Earth's surface. In the modern era, petroleum resources are sought and exploited from locations that are more difficult and hazardous, including offshore. The petroleum deposits discovered in offshore areas contain the same kind of hydrocarbon substances as those found onshore. For example, a form of natural gas called gas hydrate is available both onshore and offshore, but offshore resources are particularly of interest because of their volume and potential for future large-scale development. The reason offshore petroleum exploration and development are so prominent in this century is that many onshore petroleum resources have either been exhausted, are not economically producible, or are unable to be fully developed because of restrictions of national ownership or geopolitical problems. The expansion of resource development offshore is inevitable because of the growing demand for petroleum and petroleum products. 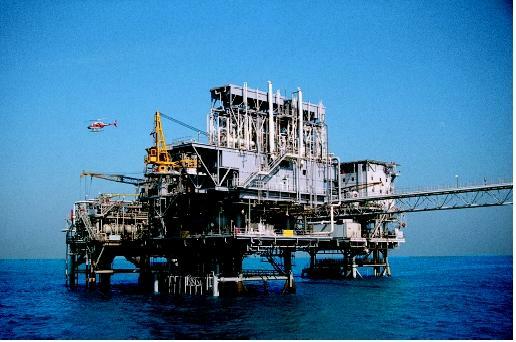 This platform, located in the Java Sea, is producing petroleum from a reservoir under the seafloor. areas are being sought offshore in all of the onshore petroleum basins, and wherever correlations of continental geologic structures are found. The technology is presently available to explore, drill, produce, and transport petroleum in water up to 2,300 meters (7,500 feet) deep, and further innovations are predicted to extend the depth range of future operations. In addition, remote sensing and remote control technology are being applied in facilities that cannot be directly operated by personnel, who live and work either in onsite quarters or onshore. Every country that has dominion over part of the continental shelf of the ocean is investigating the possibility that petroleum resources may be found and developed there, with the help of modern technology. The estimated petroleum reserves of a region provide a solid incentive for capital investment in its economic and social development. Offshore petroleum production yields tremendous economic benefits yet presents substantial risk to human life and the environment. 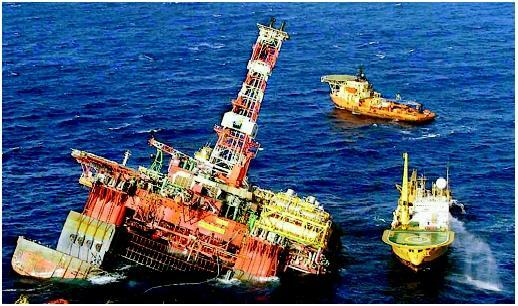 In March 2001, the Brazilian-owned Petrobras oil rig collapsed after explosions destroyed its substructure, and several workers were killed. The company collected or dispersed all but 3,200 gallons of waste oil at the location, averting a major spill. and interpretation of formation characteristics; geochemical sampling and analysis of reservoir rocks and fluids; and reservoir modeling to evaluate the potential for economic development and exploitation. The exploration stage is increasingly being integrated with other stages in petroleum resource development and management, so that all information and data obtained are additive in understanding the geologic structures being characterized and exploited. If the prospects for reservoir and field development are economically feasible, based on estimates of recoverable reserves, current market prices, and possible environmental impact, exploratory drilling can begin. The drilling program is designed according to the characteristics of rocks and formations that have been identified during the exploration stage. Offshore drilling involves the use of various technologies and types of equipment, continually being upgraded and improved for purposes of both cost efficiency and environmental protection. Drilling ships, semi-submersible drilling barges, or other mobile drilling units are preferentially used for offshore drilling. In some locations, permanent drilling platforms are installed offshore so that development wells can also be drilled at that location, though this was done more often in the past. Offshore wells being serviced or worked over or redrilled may also require reentry of the boreholes or addition of more boreholes to an existing well, requiring the use of specialized drilling rigs and equipment. The evaluation of the reservoir continues as data are accumulated and as the primary resources are depleted, and additional boreholes may be installed in order to exploit fully the oil or gas deposit. Tanker carriers are a major mode of export for petroleum resources. 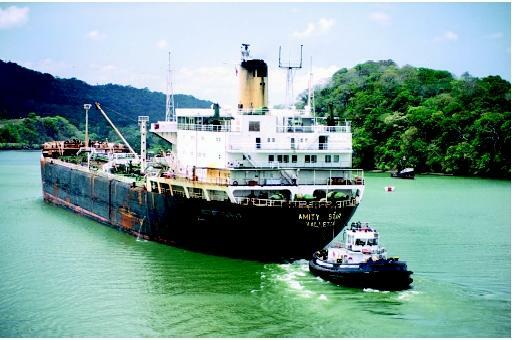 This tanker is assisted by a tugboat in the Panama Canal. Production can begin when the wells have been drilled and completed—that is, when all downhole and surface equipment has been installed and the startup of production is approved. As noted previously, offshore production involves the use of a wide variety of equipment and technology. Offshore production structures in the past were commonly installed as a permanent structure, but modern production structures include special-design production ships, mobile production units, columnar and compliant structures and buoys that are tethered or moored to the sea floor, as well as subsea production systems with underwater wellheads. If an underwater pipeline is not used to transport the well fluids onshore or to another production platform, facilities for offshore storage and offloading may also be installed for pickup by a tanker. Offshore production wells may be vertically arranged with respect to the producing formation, or may drain reservoir fluids through inclined or horizontal boreholes. Some formations may best be drained with multilateral wells, with several branches entering the producing formation at different depths and in several flow units. Production may be possible without well pumps in some locations, if there is sufficient reservoir pressure to drive the fluids toward the wells. However, artificial lift and pressure boosting of well fluids are common procedures in offshore wells. Enhanced recovery methods such as gas or water injection are also used to drive or control reservoir fluid flow toward the wells. Offshore production and drilling structures that are not removed from their offshore locations when production ceases and instead are abandoned by operators can be converted into artificial reefs that provide a habitat for marine life. On the other hand, oil leaks and spills from the abandoned structures can be ecologically harmful. The export of oil and gas produced from offshore fields to onshore markets is accomplished primarily by underwater pipelines or by tanker carriers. Pipelines of various diameters and design may be buried in the sea floor or lie on top of it; the pipelines may be connected into systems of flowlines from multiple wells and fields, or may feed the product they carry to nearby storage tanks or tanker carriers. The tankers may serve a single well or field, or may gather and deliver products at several ports and transportation terminals. Both pipeline and tanker designs are changing to better accommodate well fluid properties, distance and hazards of the transportation route, and structural standards. The reliability, economic operation, and environmental protection aspects of both underwater pipelines and tankers are improving. Remote sensing, remote control, and deep-water maintenance and repair are both detecting and preventing pipeline leaks. New standards for construction and operation of tankers are being applied to avoid accidents and associated spills. New technology is being developed to treat and process well fluids offshore, in order to decrease the volume of product being transported and to decrease the risk of leaking or spilling well fluids in the ocean environment. The value of energy-rich petroleum in all of its forms lies in the many products that can be made from it and the importance of their uses. Crude oil, natural gas, and other hydrocarbon compounds are the bases of the fuel products that are essential for modern modes of transportation, which are predominantly fueled by motor gasoline, jet fuel, and diesel fuel. Petroleum also provides fuels for heating, industrial-manufacturing processes, and generation of electricity. Petroleum can be converted into petrochemicals and derivative products, such as pharmaceutical ingredients, plastics, and building materials, which represent other portions of the petroleum-source market. Both supply and demand factors drive the investments and operations that the petroleum industry makes in exploring and exploiting petroleum resources. When petroleum prices in the market are high, the industry can afford to produce resources that might otherwise be uneconomic and can invest in new technology to reach resources that would otherwise be unavailable. When petroleum prices in the market are low, even proven reserves may not be produced because the cost of development and production would not allow any profit for operators. The definition of reserves depends upon economic factors as well as actual accumulations of petroleum. Limitations of the technology needed to exploit reserves may also affect the definition and the potential for present development. Countries without domestic petroleum resources are increasingly dependent on imported oil and gas, derived fuels, and petrochemicals, a factor that affects their domestic security. Petroleum resources define modern trade patterns and stimulate both international marketing and the potential for war. As petroleum supplies decrease and their prices climb, the pressure to develop more expensive reserves and to develop alternative energy sources is expected to increase. SEE ALSO Energy from the Ocean ; Mineral Resources from the Ocean ; Oil Spills: Impact on the Ocean ; Transportation . Energy Information Administration. Annual Energy Outlook 2000: With Projections to 2020. DOE–EIA–0383 (2000). Washington, D.C.: December 1999. Glasner, David. Politics, Prices, and Petroleum: The Political Economy of Energy. San Francisco, CA: Pacific Research Institute for Public Policy, 1985. Hyne, Norman J. Geology for Petroleum Exploration, Drilling, and Production. New York: McGraw-Hill, 1984. Gas hydrate is an ice-like, crystalline solid consisting of gas molecules, each surrounded by a "cage" of water molecules. Gas hydrate may form as cement in the pore spaces of sediment as well as in layers and nodules of pure hydrate. Most marine gas hydrate contains methane. Pressure and temperature are the two major factors controlling the formation and stability of gas hydrate. Gas hydrate is stable at the temperatures and pressures that occur in ocean-floor sediments at depths greater than 500 meters (1,640 feet). Gas hydrates are also stable in association with permafrost in polar regions, both in offshore and onshore sediments.